This spare little story is set in a small Wisconsin town. Despite the pastoral setting and the narrow-minded, clannish inhabitants of the town, Enoch Wallace, keeper of an intergalactic transport system known as the Way Station, is a very likeable and open character. This wonderful, thought-provoking book is a fast and easy read. There is no action, no alien battles in the stars, no government agents surrounding the Way Station and bundling Enoch off in an unmarked van. 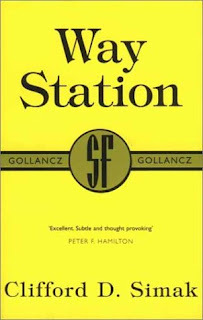 Way Station is a very quiet book that explores war and violence, racial tolerance, friendship and loneliness and what the definition of home is. 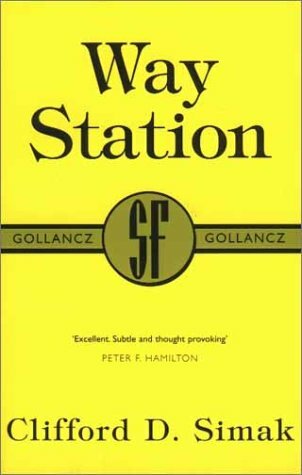 "For years I've tried to understand and to conform to the ethics and ideas of all the people who have come through this station. I've pushed my own human instincts and training to one side. I've tried to understand other viewpoints and to evaluate other ways of thinking, many of which did violence to my own. I am glad of all of it, for it has given me a chance to go beyond the narrowness of Earth."